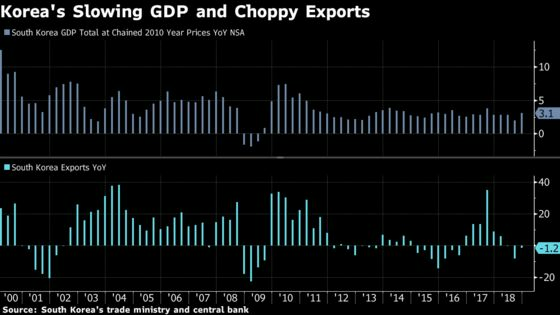 (Bloomberg) -- South Korea’s economy gained some speed in the fourth quarter as increased spending by the government helped offset slowing exports. Gross domestic product expanded 1.0 percent from the previous quarter, versus economists’ median estimate of 0.6 percent. From a year earlier, the economy expanded 3.1 percent, compared with an estimate of 2.7 percent. Slowing export growth toward the end of 2018 has sparked fears of an economic slowdown in Korea. Economists are concerned that the government may not be able to keep propping up GDP. "The government made a good effort to boost growth in the last quarter, but I don’t think this can last for long," said Joo Won, an economist at Hyundai Research Institute. "Conditions will probably worsen this year because of weakening exports and that will lead to a slowdown in investment in the end, especially semiconductors." Weakening semiconductor exports, the down-shift in Chinese growth and the U.S.-China trade war are significant risks for Korea. Bank of Korea Governor Lee Ju-yeol has expressed concern over the global slowdown and trade tensions, but record household debt and fears of financial imbalances limit his options for responding. "Slowing external growth and weakness in domestic investment are the biggest near-term risks to South Korea’s economy," said Bloomberg Economics’ Justin Jimenez. "We expect heightened risks to growth and muted inflation due to soft domestic demand to keep the central bank on hold. Governor Lee Ju-yeol has highlighted the need to keep policy accommodative. We expect the BOK will leave its policy rate at 1.75 percent through year-end." Government spending increased 3.1 percent, the highest since the first quarter of 2010, when it rose 3.4 percent. Export volumes in the GDP figures fell 2.2 percent in the fourth quarter from the previous quarter, when they gained 3.9 percent. Import volumes rose 0.6 percent, following a 0.7 percent contraction in the previous quarter. Facilities investment rose 3.8 percent after dropping 4.4 percent in the previous quarter, and construction investment rose 1.2 percent from the earlier quarter, when it contracted 6.7 percent. Private spending rose 1.0 percent.